With sincere intentions to preserve and uplift our reputation in the market, we bring forth a distinguished assortment of Fume Scrubber. 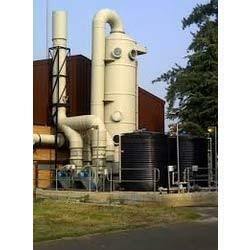 This scrubber is used in diverse processing industries for removing harmful fumes. Started in the year 2010, Chaudhary Polymer has become one of the renowned manufacturer and wholesaler of a comprehensive range of Industrial Filters, Industrial Oven, Industrial Blowers, Electroplating Plants, Wet Scrubber, Industrial Pumps, Industrial Tanks, Water Treatment Plant and Electroplating Accosories. Offered collections of these products are made with the employment of quality tested material and pioneering technology in adherence with set industry standards. The offered products are hugely cherished by our respected clients owing to excellent performance, reliability, longer functional life, high efficiency, premium quality, smooth operation and sturdy design.